Download the FULL 2006 TBM Bootleg! Birthday Massacre 2006 Bootleg DVD! Sponsored by: The Birthday Massacre startpage. Individual track mp4s as well as a single 1.84 GB chapter marked iTunes copy of the main feature are online for free at the above address. If you’re interested in the full DVD image though, you can finally download that! Use the below torrent and burn your own copy. 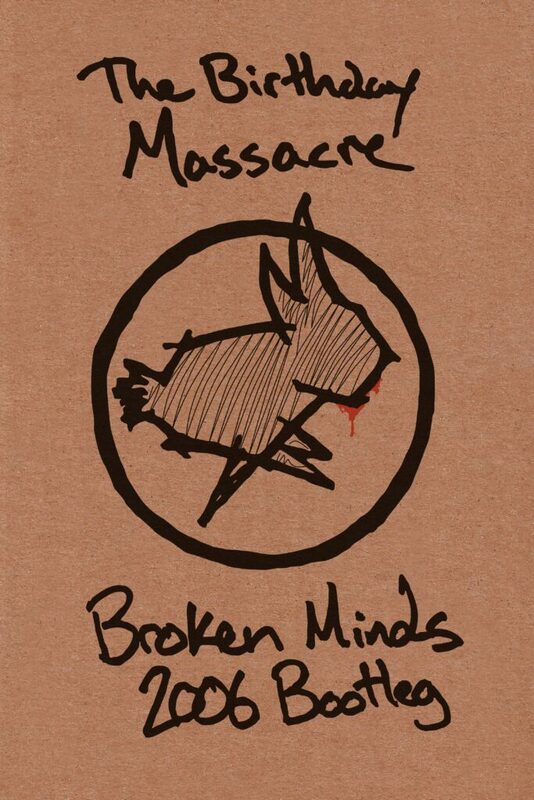 Available for free, The Birthday Massacre’s 2006 Bootleg DVD is a set of twelve tracks from the Broken Minds tour. Shot, cut, and proudced by TBMChicago’s Eric Ingrum, the songs were all captured during one of the many performances he attended while helping promote the nation wide tour. After shelving the footage for an entire year, it was finally edited during the corse of a single week. Marathon editing sessions where made in an effort to complete the DVD in time to give the final copy to the band at their last show of the 2007 tour. Only twenty-five copies were made, under the agreement that only the band, Eric, and their mutual friends would recieve them. A video showing a bit of the process and final product was posted shortly after. An incredible amount of interest in the “Making of” video eventually prompted an agreement to release the entire DVD online. The DVD image torrent just went up, so the downloads could be a little slow for a few days. Please help us out by seeding and sharing this! If you don’t understand torrents, you can still grab all the easy mp4s from The Birthday Massacre Live DVD page on TBMChicago. This is an account of my two month perfectionistic drive to write our 45 second intro music. The show has been out for a few days now (you can get it for free on the Creative Commons license so people can take anything they want from it and use it in their own stuff. As I describe on the site, “content can be copied, distributed, adapted, tastelessly brutalized, and otherwise used without any permission – under the condition that it’s credited appropriately and linked to DoubleFeature.fm. This lone condition can be waived if absolutely necessary.” You can hear the full theme above, on our myspace, or at Last.fm. DOUBLE FEATURE: Our show now online! RSS Feed for the show! Double Feature, hosted by Eric Ingrum and Michael Koester, is podcast detailing two films per episode. Riddled with blasphemy and a humble (but vicious) sense of humor, the podcast is an experiment in film watching. Each show both hosts pick a movie they’ve seen a hundred times that the other’s never watched, and then view both movies back to back. Uninterested in actually reviewing the films, they discuss what makes them notable against an abundance of others. There are currently three shows up. The audio setup still isn’t finalized; the recording quality will get better in the coming weeks (I promise!) The show goes up every Thursday at 2am. Thanks to everyone in advance. We’d love some feedback. Comment. Everywhere. On everything. Looking forward to hearing from all of you! DOUBLE FEATURE Podcast has a Date! I don’t get days like this often enough. I come bearing news. Mark your calendars. You know Double Feature, that podcast I keep saying will go up one day? Well, it’s got a launch date! After months and months of work, we’ve got everything prepared to go online. The podcast, website, and all the rest goes online July 25th, 2008. Double Feature is podcast detailing two films per episode. Riddled with blasphemy and a humble (but vicious) sense of humor, the podcast is an experiment in film watching. Each show both hosts pick a movie they’ve seen a hundred times that the other’s never watched, and then view both movies back to back. Uninterested in actually reviewing the films, they discuss what makes them notable against an abundance of others. Hosted by Eric Thirteen and Michael Koester. Nine more days and you can listen to me embarrass myself on a weekly basis. If you have an RSS feed thingy, or you use AwesomeStart, you can totally just pop that in there and get updates that way. Apple’s Mail client in Leopard also uses RSS now, which is cool. Yay.